Earlier this morning, I had the distinct pleasure of attending the Bar Mitzvah of Samuel Oziel, son of of Jimmy Oziel. The davening and simcha was at the Petah Tikva Synagogue in North York. Sammy has the same weekend in February as his uncle Isaac Oziel. Davening started at 8:00 am. sharp. Today is also Rosh Chodesh. We continue with Davening and we hear Samuel Oziel’s uncle Solomon Oziel. The next video as the title suggests, should have been joined to video following this next one. &&nbsp: The Bar Mitzvah accompanied by his father Reb Jimmy Oziel return the Torah to the ark. The Celebration continues with a procession from the Sanctuary to the brunch. And what a brunch it was indeed! Jimmy and Annie pull a class act; They have a quartet for classical music. How elegant it was. Annie and Jimmy Oziel show some real elegance with a four piece classical music ensemble. A week later, February 16 at Petah Tikvah Synagogue Samuel Oziel is called to Lein the Torah. Because it is shabbos, we cannot take pictures or make videos. But that Saturday night, Jimmy and Annie put on a tremendous Bar Mitzvah Party for Sammy. 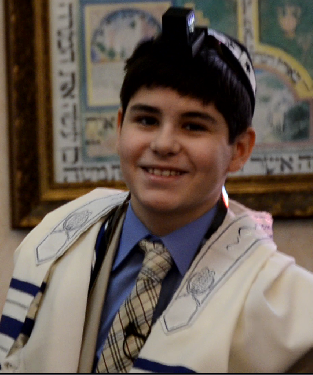 Enjoy the video’s below from the Bar Mitzvah Party for Samuel Oziel held at Beth Tikvah Synagogue on Saturday, February 16, 2013.